Mummy Daddy and baby telephone boxes so you can all call home. That's fantastic, Mo! Where did you get this shot? I'm a big fan of the old red boxes. Unfortunately there are not many left here! Glad that White Tiger is travelling around the world. Hope you liked it. Ciao. A. Love this! Is it outside the Church or part of the University? A great spot. I love the geometry of it all, such great angles. Besides the telephone boxes, I also love those window arches. Would you like to join photographic networks for fun? There are memes there at different days that you may be interested to join and viewed and commented by bloggers around the world. I ask because you have so many beautiful pictures that are worth sharing, hope you don't mind. What a fun shot!!! Why do they have different sizes like that, though? Fine compose, great color contrast and interesting picture. I heard these boxes were going away. I'm so happy to see these three in a row. But why is the third one smaller? Fabulous backdrop to the humor. Love how you caught the biker in the photo too. Awesome. I love the bright red boxes against the copper colored brick. But I have to go along with Hilda and wonder why the third one is so much smaller. Very nicely spotted. I wonder why they are spaced like this. Here in Copenhagen they would either be right next to each other or a couple of blocks away. I love the red phone boxes. They are so iconically British. It breaks my heart to think they're going by the wayside. Excellent photo! Thes red boxes are just too nice ... and to find three togehter, it's almost too much!! Reminds me of the 3 bears, say, this telephone box is just right! What a great find and it is brilliantly composed. This is a winner, Mo! What a shot. 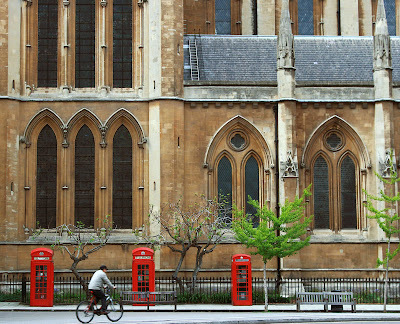 Everything in harmony, even to the guy on the bike between two phone boxes. I just love it. Well done! that's right across the square from where i went to school until about a month ago... thanks for the deja vu!